Last year my neighbor’s boyfriend asked me about the shoes I was wearing. He is an older gentleman and probably in his late 60s. Nice guy. I was wearing a pair of brown longwings (or is it long wings?). He told me he use to have a similar pair years ago but would never go back to wearing them because they were too heavy. He said he was very happy with his current shoes and that they were light, comfortable and with good grip. I am not sure what brand he was wearing but they were black, bicycle toed and with injection-molded soles. He talked about shoes like my mom talks about wall to wall carpeting being better than hardwood floors. Why go backwards? Progress. This is America. I was very nice and listened to him but finally I said, “Look, your time has past. 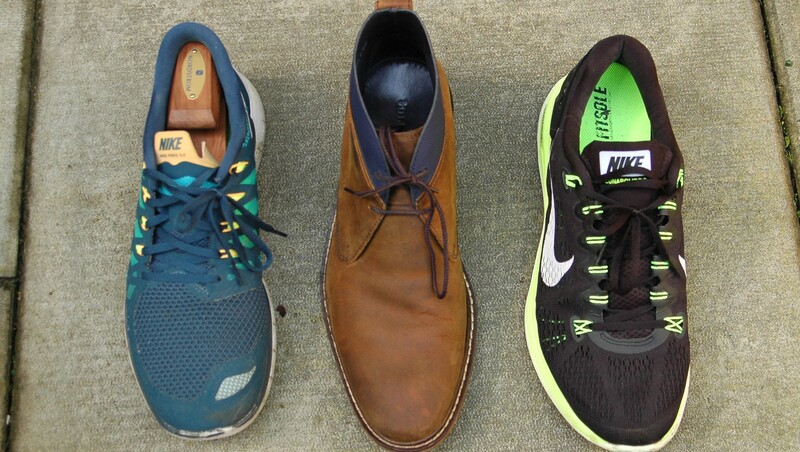 Its time for a new generation to wear and cherish your old, hand me down shoes. Give them to us. NOW. Do you still have them? Are they shell?”. Okay, that part of conversation was made up. 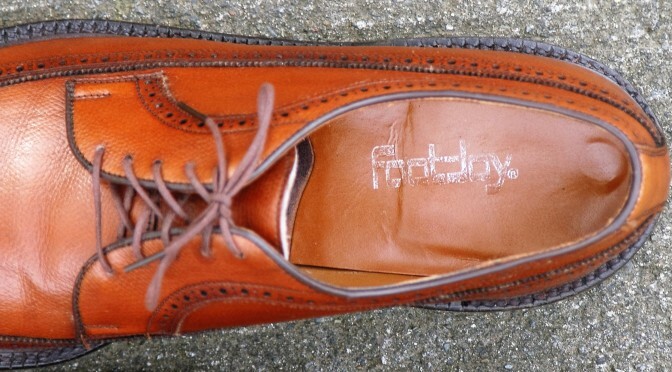 I thought of this heavy shoe conversation recently when I bought a pair of vintage FootJoy longwings. As I pulled the shoe out of the shipping box, I thought “these are heavy”. This pair felt like they were lined with lead. But were the shoes heavier than my other shoes or had my muscles atrophied? I needed to find out. To answer this question, I decided to weigh a number of my shoes. 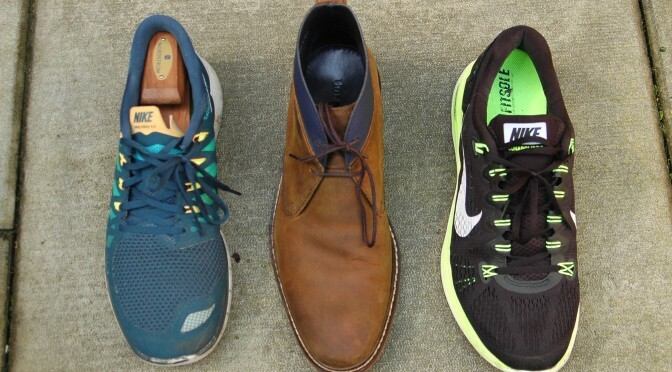 When weighing them I grouped the shoes into three categories: bluchers; balmorals; and Nike. My assumption in weight was that bluchers > balmorals > Nike. 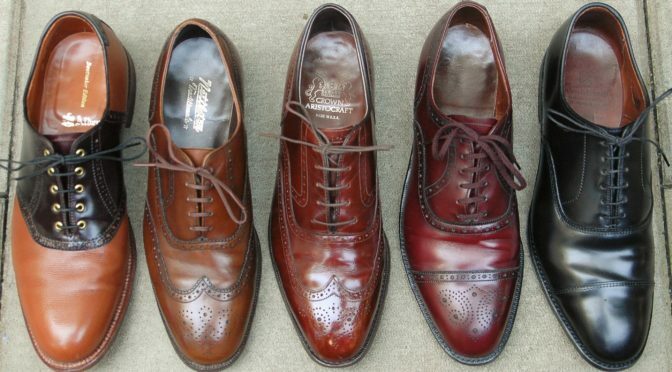 These were the blucher shoes that were weighed (left to right: Nettleton; Florsheim Imperial; FootJoy; Florsheim Royal Imperial; Alden). Balmorals (left to right: Alden; Nettleton; Johnston & Murphy; Cordwainer Wright; Allen Edmonds). Below were the results in ounces for a single shoe. Multiply by 2 to get the full pair weight (obviously). I also converted ounces to grams (1 ounce = 28.349523125g (why is the USA still using imperial measures??)). Sure enough, the FootJoy was the heaviest shoe. Not exactly sure why this pair is so heavy. The soles of the FootJoy are thick and wide but not unusually wide or thick for a vintage longwing. Its possible it has a heavy steel shank embedded in it. It is interesting that the Florsheim Royal Imperial is lighter than the Imperial. The Royal Imperial longwing is a 1990s model and it replaced the Imperial longwing. 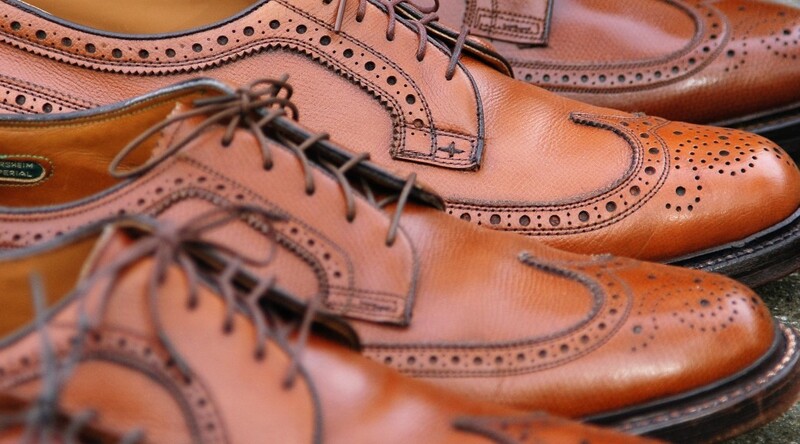 It wouldn’t surprise me if Florsheim was cutting back on materials by then. Maybe the shank is lighter. The Imperial soles are noticeably wider than the Royal Imperial. 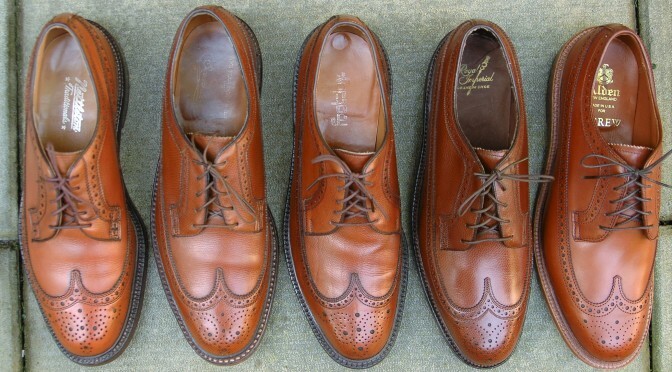 Also interesting that the Allen Edmonds Park Avenue was one of the lightest shoes. Its a shell cordovan model and maybe shell is just lighter than calfskin. Not surprisingly the Nike shoes were the lightest. The Nike Free was a third the weight of the FootJoy. Its like I am constantly carrying a liter of beer when wearing the FootJoy shoes compared to the Nikes. All day Oktoberfest. Is there an advantage of wearing heavy shoes? More weight does equal more calories burned but that’s all I got. I like them because I don’t look like everyone else. But its possible you’ll find me in 25 years wearing vintage black, bicycle toed shoes and reminiscing about the days of President Trump. Very interesting to read your blogs ! I am now an avid reader ! !